In Belgium, as is always true in the immediate aftermath of terror attacks, what we know is constantly changing. Hours after two explosions at Brussels’ international airport and a third at the Maelbeek metro station, the death toll stands at 34 with 170 reported injuries. We’ve seen this before, and know how it goes. In the days and weeks that follow, there will be much more intel gathered and information shared. But a lack of information has never stopped pundits and politicians from weighing in, and in the case of this latest tragedy, that fact remains as true as ever. While some delivered measured remarks, and others waited to learn the details before speaking, here are the worst immediate responses to the attacks. Is there a new FCC regulation mandating that every morning program has to give Donald Trump a slot to weigh in on international tragedies? This morning, seemingly all of America’s talk shows allowed Donald Trump to speak ad nauseam about his thoughts on the Brussels attacks. If the media is still confused about the role the media played in Donald Trump’s ascension to the top of the Republican heap, the media should really review the tapes of Donald Trump’s triumphant media tour this morning. They were pretty much in keeping with everything else he has said at this point about closing borders, keeping Muslims out, and seeing ISIL under your bed, with an extra dose of “I told you so” and “things can only get worse from here” added for good measure. Trump on the Today Show: "If they could expand the laws, I would do a lot more than waterboarding. You have to get the information from these people." He went on to blame the president for refusing to acknowledge that “[r]adical Islam is at war with us.” Cruz concluded his message by saying that we are going to take down ISIL “on Jan. 20, 2017, when [he is] sworn in as president.” Because if you cannot exploit a horrific tragedy for your own political gain, what good is horrific tragedy in the first place? “Obama cannot distinguish between Israel and Islamic terrorists who seek to murder us," Cruz said. Kasich echoed the message of closing borders. "We've pretty much agreed there's no way to vet refugees," he told Fox News. More than half the nation's governors opposed allowing refugees in November, including Ohio governor John Kasich. "Instead of Congress rubber-stamping this program each year, we ask that you and Congress work with states and governors to thoroughly review this process and how states are affected," Obama had said. However, nine states still accept Syrian refugees and another seven are seeking more information. 4. Conservatives who are angry that Obama is in Cuba, which is to say all of them. Republicans have been annoyed about Obama’s Cuba trip since before his plane touched down. (Actual quote from Ted Cruz’s op-ed, in which he compares the president to “scary” black radicals such as Angela Davis and Stokely Carmichael: “Meanwhile, political prisoners languishing in dungeons across the island will hear this message: Nobody has your back. You’re alone with your tormentors. 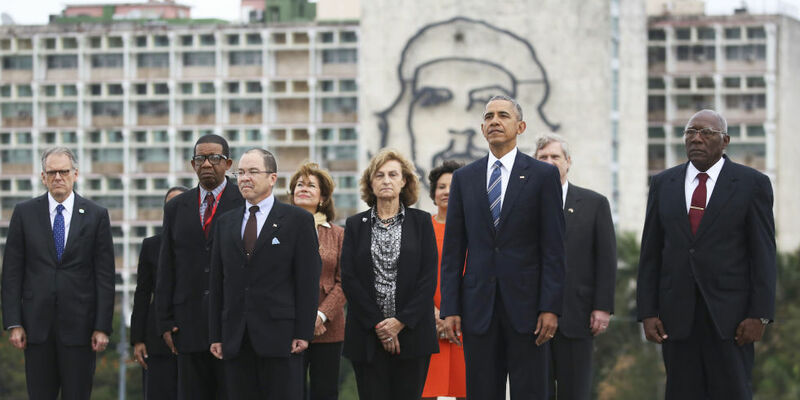 The world has forgotten about you.”) It seemed that peak ODS was reached after they viewed a picture of the president in front of a huge mural of Che Guevara’s face. Several Republicans urged President Obama to cut his trip short, including Peter King, who saw a chance to retroactively get in another jab about the Paris attacks last year. And of course, various conservatives have taken to Twitter to disparage the president for happening to be in Cuba when the attack occurred.